Why should you go for V-neck Aprons? If you own a salon or a spa, you know the struggles of keeping your staff’s clothes protected from hair, hair colors, chemicals etc. This is where salon aprons, come into picture. A good quality apron will protect the clothes worn underneath the apron very well under all circumstances. While aprons come in a lot of styles, a V-neck apron, as the name suggests, is one whose neckline is cut out in a V-shape. 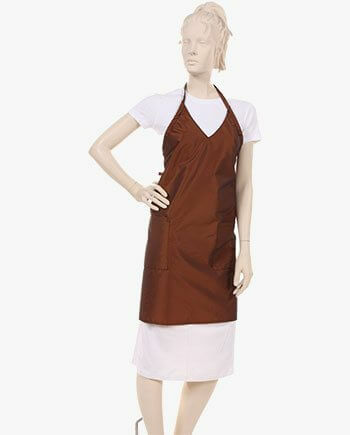 It’s perfect style for those love to dress up chic, and hip, therefore V-neck aprons are a perfect choice to go with! Consider a hairdresser’s job, for instance, we can all agree; It’s certainly it’s not an easy one! They juggle with so many tasks, and their job requires working with water, chemicals, colors and hair. This is why it’s important that salons, invest in cosmetology aprons. It’s even better when it’s a cute apron, which would safeguard their clothes from any kind of harm. What Makes our Aprons Stand Out from Others? There are plenty of aprons in the market, but which one is the best kind, that would suit your requirement? These are the questions, which should be considered before you go ahead and make a purchase of aprons in bulk. Also, the fabric of your apron should be nice in texture and lasting, so if by chance something spills on it, it doesn’t get to your clothes. 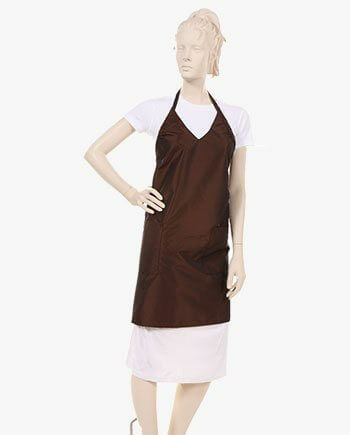 At salonwear.com, you can pick up any apron of your choice at any time, with additional bonus option of customized aprons. You can customize the aprons of your staff, by embroidering or silk screening your salon logo on each and every member’s apron. For any salon artist, an ideal apron would be the one that they can wear at all times comfortably, so it should be such, that it comes in handy, when they are doing the haircuts, makeup., chemical treatments etc. While you can go with any neckline of your choice for a hairdresser aprons, a V-neck, apron might make more sense. It’s trendy and goes with just about every outfit! Besides, it’s super comfortable, so your hairdresser would not feel like, they are wearing multiple layers of clothing, therefore a V-neck apron is just the right kind, for any salon staff, who needs to be on their feet, at all times. With salonwear.com you get spoiled for choice, as there are so many options, to choose from! 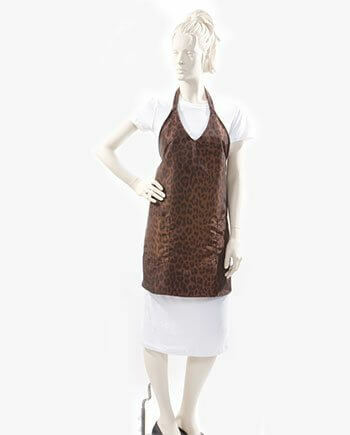 You could go with Silkara iridescent fabric in black, bronze, or brown, or a V-neck apron in leopard print. If you are someone, who likes, their staff to stand out and look sophisticated, in beautiful aprons, then you can go with an option of aprons with trim bottoms, or ruffle tops. 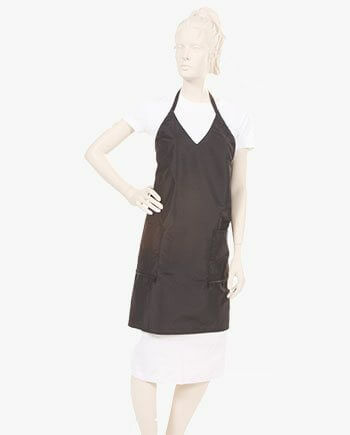 Not only will these aprons, serve the purpose of an apron, that essentially, a salon or spa artist’s apron, is supposed to serve, but also it will give a boost of confidence to your staff as obviously they will look and feel good in their stylish aprons, all the while protecting their clothes from any kind of chemicals or stains.